What ski company made the Zebra-Ski? 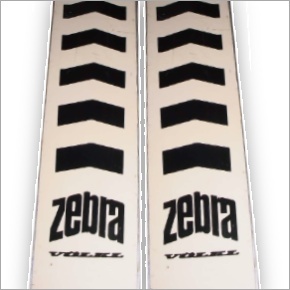 There were many readers who knew that it was Volkl that introduced the Zebra-Ski in 1967. The first person to post the correct answer on my blog was regular RetroSki contributor Gary Tomlinson from Fernie, British Columbia. A close second was Bill Hays who pointed out that it’s “Volkl, mit ein umlaut!” Jeff Waxman also posted the correct answer. The original Zebra-Ski, as the name implies, had stark black and white stripes making it very distinctive. SKIING magazine called it “the most way-out looking ski of the season.” The cosmetics may have drawn the attention, but it was a quality ski that incorporated state-of-the-art features such as both bottom and top cracked edges. Those cracked edges allowed the ski to flex more freely and gave the ski a reputation for holding very well on ice. I never skied on the Zebras, but I remember that it was the first Volkl ski I had ever seen. While Volkl was known in Europe, I believe it was the Zebra that established the Volkl name in the United States. 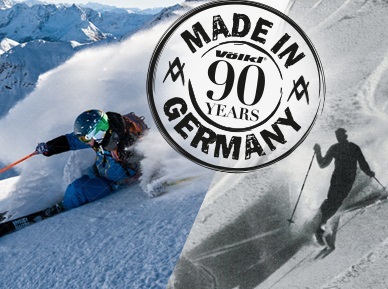 This year Volkl is celebrating its 90th anniversary in the ski industry making it one of the oldest ski companies still in operation. Georg Volkl was a cartwright in Straubing, Germany. The company he started in the late 1800s made wagons and carriages. In the 1900s, Georg’s son, Franz, diversified the company to make other wood products. In 1923, Volkl produced their first ski, the Vostras. Since introducing the Zebra-Ski, Volkl has been known for engineering advancements in ski design. They followed the Zebra with the Renntiger (Race Tiger), an all metal ski. Then Volkl produced the first all carbon fiber ski. In subsequent years, Volkl ski technology would blend metal, fiberglass, and wood to produce skis that attracted both recreational skiers and racers. One of their recent features was the Power Switch series which allowed you to change the ski flex with a two-setting switch. 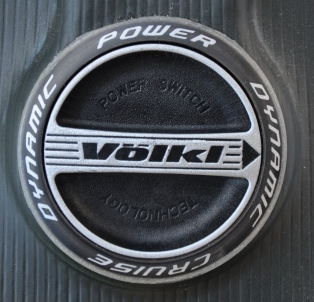 Other ski manufacturers had tried to achieve similar results with adjustable weights, but Volkl used an internal spring mechanism controlled by the switch. There was the Power (Stiff) setting and the Cruise (Soft) setting. I can attest that the switches did make a difference. I got a pair of Tiger Sharks with the Power Switch technology and after my first day on them, I wasn’t totally happy. I should say that at that time I’d already been skiing on Volkls for twelve years and was a big fan. So what was the story with these? I checked the switches and found one ski was set to Power while the other was on Cruise! Once both skis were on the same setting – either Power or Cruise – the skis were great. I always liked the Power setting better since I felt quicker, but that was based solely on perception. Today even though the company is headquartered in Switzerland, Volkl skis are still manufactured at a plant in Straubing and the company takes great pride in its “Made in Germany” identity. They produce a wide range of skis for all the various skiing disciplines: alpine racing, moguls, aerials, freestyle, big mountain, powder. And Volkl skiers such as Hannah Kearney have had a lot of success including the Sochi Olympics. The current Volkl ski line incorporates all the latest trends in ski design from full rocker to partial rocker to traditional camber. Happy 90th anniversary to Volkl! Many thanks to David Hatoff for suggesting that Volkl’s 90th would make a good column topic.